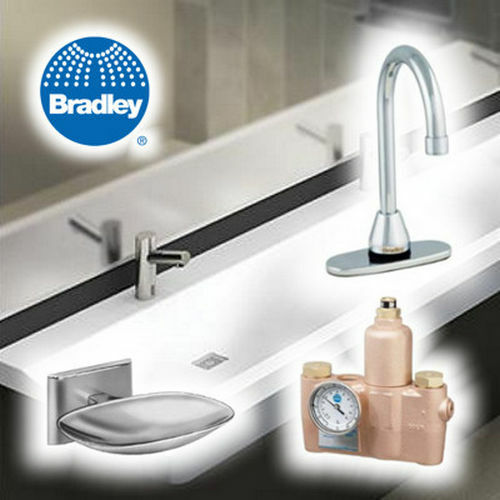 Headquartered in Menomonee Falls, Wisconsin, the Bradley corporation has been providing an assortment of plumbing and restroom accessories to clients of all sizes. In 1917, Harry Bradley wanted to create a system of sinks that took less floor space and allowed workers to speedily wash their hands. By 1918, Bradley had his first working prototype “washfountain” and the following year, secured a patent before finally founding Bradley in 1921. From that day forward, Bradley has been providing innovative products to the masses. Continued growth and innovation throughout the past 95 years has allowed the Bradley corporation to increase product offerings beyond washfountains to include chemical safety equipment (emergency eyewash fixtures and drench showers), commercial faucets, commercial and group showers, electric tankless water heaters, multi-station lavatory systems, patient care lavatory units, solid plastic locker systems, terreon solid surface products, washroom accessories, and washroom partitions. Not to mention a line of specialty products like an all-in-one touchless handwashing fixture and stainless steel ablution panels for religious cleansing. Bradley washroom accessories are proudly featured in facilities of all sizes, from corner mom and pop shops to international corporations including AMC Theaters Corp., General Motors, the U.S. Postal Service, WalMart, and W.W. Grainger.